Free Valentine’s Day printables are a great way to make memories with your kids that go beyond those cliché boxed cards all over the stores. Try memory books, fun decorations, or even sneak in a little bit of learning. Browse through some of these fun ideas we have collected and then print off your favorites. I Love You Because Free Printable – Passion for Savings has created this adorable printable for you to do with your kids. It’s an interactive way to elicit conversation with your kids while being entertained with their answers. Print one off every year and keep them in a special scrapbook, to watch how the answers change over the years. Teachers can also use them for an easy take-home gift with their students. Kids Activities has a more open-ended version for writing practice and creativity. Monster Memory – Glue Sticks and Gumdrops has created this cute little monster memory game for Valentine’s Day. Print off two sets on cardstock for durability and laminate if desired. Cut apart all of the cards and turn them over for a fun and simple matching game. Or, keep one set in tact while separating the second set for a more controlled matching activity. Valentine’s Day Chatterbox – Maybe you called them cootie-catchers, or even some other name, but this chatterbox printable from In the Playroom is a fun game to play kids. You have your choice of her preloaded template or create your own words and phrases on the blank template. Then, relive your childhood! Valentine’s Day Wordsearch and Bingo – Keep your kids entertained with these free Valentine’s Day printables from Blooming Homestead. One is a wordsearch that was entertaining enough for her nine year-old. The Bingo game is easily fun for the whole family! Need a more advanced wordsearch? Check out this one from Crazy Little Projects, that also includes a free printable Tic Tac Toe game. Pre-K Pages has another Valentine’s Day Bingo game that you can print in color or black and white. Valentine’s Day Learning Activities – Help your kids keep on learning with some free educational Valentine’s Day printables from Family Centsability. Choose from a Word Unscramble or Printing and Spelling Practice. Valentine’s Day Matching – For another great and adorable free printable matching game, check out the one at Cuzinlogic. 10 Frames Valentine’s Day Math Printables – These cards from A Little Pinch of Perfect help your children with one-to-one correspondence, as well as numeral printing practice. Trace the numerals on the cards and then count out candy hearts to practice quantities. The new Valentine’s Day printables pack for this year includes a whole gamut of skills, including pre-writing, language, math, coloring, and more. Letter and Number Heart Puzzles – Free Homeschool Deals has created a couple of heart-themed letter and counting matching activities in the form of puzzles. Match upper and lower case letters while practicing beginning sounds, or numerals to number words with quantities. Color Words – Practice sight word recognition of the color words with this heart-themed booklet from I Can Teach My Child. The color version helps children learn to recognize the color names. The black and white version lets children color as they practice the words. Valentine’s Day File Folder Games – File folder games make for fun manipulative activities with kids. Itsy Bitsy Fun is offering up four free games that teach shapes, colors, letters, and numerals. Roll and Color Valentine’s Day Counting Game – These games where you roll a die and keep moving your way across a board are always a lot of fun for kids. Here is one from Mom Inspired Life. Candy Heart Patterns – Patterning is such an important skill to learn. Modern Preschool created a series of patterns that you can use with candy hearts (or even heart-shaped beads) to practice ABA, ABB, and ABC patterns. Or, create your own! Valentine’s Day Scavenger Hunt for Kids – I have fond memories of the Easter scavenger hunt that my parents prepared for us every year. Make the same kinds of memories with this Valentine’s Day version by Adventures in Wunderland. It’s also a great way to promote reading skills! Valentine’s Day Scrabble Math – I absolutely adore this idea. Combine language and math by practicing spelling holiday words with Scrabble tiles. Then, add up the numerals. For even more learning fun, go back and write the words into this printable designed by And Next Comes L.
Valentine’s Pattern Block Mats – Pattern blocks are great for color and shape recognition. They also allow for lots of open-ended learning. Try these fun mats from Playdough to Plato to get the fun started. Valentine’s Day Music Worksheets – These are some of the most unique Valentine’s Day printables I have found. Ear Training and Improv has managed to incorporate the holiday into music theory practice. Follow-up activities also included. What is your favorite kind of printable to use with kids? When you think of giving a Valentine’s Day gift, images of decadent chocolate and other sweet treats pop into your head. You can just imagine the tastes melting on your tongue. But what if you are trying to cut back on the sweets? Not everybody wants to have a sugar overload for yet another holiday, but you still want to create something that conveys affection to your sweetheart. Check out some of these candy alternatives for Valentine’s Day gift-giving. You’re the Write Stuff Valentines – Do you know an aspiring writer? Or would you like to encourage kids to put pen to paper? These inexpensive and easy valentines are the perfect way to send a loving message and inspire further creativity through the written word. Three Different Directions provides a free silhouette file and PDF printable to use with mini notebooks and pencils. Sports Valentines – Have a sports lover in your life? Celebrate a love of basketball, soccer, and football by matching up these printables from Glue Sticks and Gumdrops with ball party favors from the Dollar Store. You’re a Great Catch – Glue Sticks and Gumdrops also has this cute fish-themed idea. Print off her card toppers to put with a bag filled with fish-themed objects. Get creative with stickers, mini fish toys, or anything else you can find! Color Your Heart Out – Coloring is a hot craze right now. Granted, it is mostly adults who are talking about it, but kids still love to do it. Mom’s Messy Miracles created this simple printable card that you can affix to a box of 24 crayons as a fun gift. She also includes a couple of heart-themed printable coloring pages to get you started! DIY Crayon Hearts and Valentine’s Day Cards – Mom Dot Com has a great tutorial on how to create your own melted crayon hearts that you can attach to homemade cards. Inspire creativity and have fun coloring! Bouncy Ball Valentines – Have a ball this year by printing off these cute gift tags from DIY Inspired and then attach them to a little baggie containing those fun bouncy balls that can be found in party favor sections of stores. Valentine Bookmarks – The Thrifty Couple came up with these cute bookmark ideas for their kids to pass out to their friends as an easy Valentine’s Day gift. They made two kinds: one out of paint sample cards and one out of scrapbook paper. They are super cheap and easy to create. Random Mommy also has bookmarks, made out of ribbon, craft foam, and buttons. DIY Seed Packet Valentines – Inspire that spring feeling with these seed packet valentines from Faithfully Free. Let your loved ones know how much you “dig” them with the free printable that you attach to an inexpensive packet of seeds. DIY Recycled Seed Paper Heart Valentines – Another great way to use up extra paper around the house is to make your own recycled paper. JaMonkey shares a way to incorporate seeds into the paper so that your valentine can grow some beautiful flowers, or whatever else you would like to mix in with the paper. There’s also a free printable card that you can attach them to, if you don’t want to make your own. Valentine’s Day Flower Pots – Or, give your loved one a plant or a flower in a pot that you have specially painted just for them. Simply Darrling has a great tutorial on how to design a themed flower pot to give as a Valentine’s Day gift and a glimpse of spring. Heart Soap Valentine – Inspire cleanliness in the young ones, or help your friends decorate the bathroom with these cute heart-shaped soaps from Dukes and Duchesses. Keep the small hearts on their own or put them inside a larger piece of soap. Then, use the free printable as a tag to go with them. What are you giving to your loved ones this year? Have you ever used the Closed Captioning (CC) function while watching videos? Some people actually need to use this feature, because they cannot easily hear what people are saying. When you’re at a bar or other busy place, someone may turn on the captioning so that you can still “hear” what is going on in the midst of the noise. Others like to do it just for fun. Obviously someone has to take the time to type out those captions. You can be that person, and make a few extra bucks while doing so. Rev.com is a site dedicated to creating transcripts for people to read. While they have an option for transcriptionists, I work on the captioning side of the site. We get pre-recorded videos that we watch and caption for a variety of clients. Files may be as short as 30 seconds, or as long as a few hours. Nothing is live captioning. We are not allowed to discuss the details of our clients, so I cannot tell you anything more than that. You get to choose on which project you work, making it a worthwhile and entertaining way to earn some extra money. When you apply, you fill out a profile and verify that you have the requirements. Basically, you need access to Chrome or Firefox, high-speed internet, and a good set of headphones. High-quality ear buds are also better than just using your computer’s speakers, but I definitely prefer my headset. After watching several tutorials, do a practice video. If you show potential, they will let you know what you need to work on and then get even more training. Then, you try another video. If you pass, you become a Rookie. Rookies are limited in what they are able to caption and make a lower rate. Every video is graded by a team of hand-selected Quality Control experts, with a rating system and comments about what you did well and how to improve. Fulfill the minimum number of minutes within a given time frame and maintain high enough scores and you become a Reverr. This grants you access to more videos and a bump in your pay. Keep on doing well, churning out a high number of captioned minutes and maintain high metrics, and you can become a Reverr+. At this stage, you get access to videos before those on lower levels and can end up earning even more money. Earnings are based on audio minutes. Let’s say you have a five-minute video at the rate of 60 cents a minute. You will earn $3 for doing that video. While this seems like a negligible amount, those short videos often go quickly and can add up. Larger projects will bring in more income. Some projects end up being worth much more per audio minute. 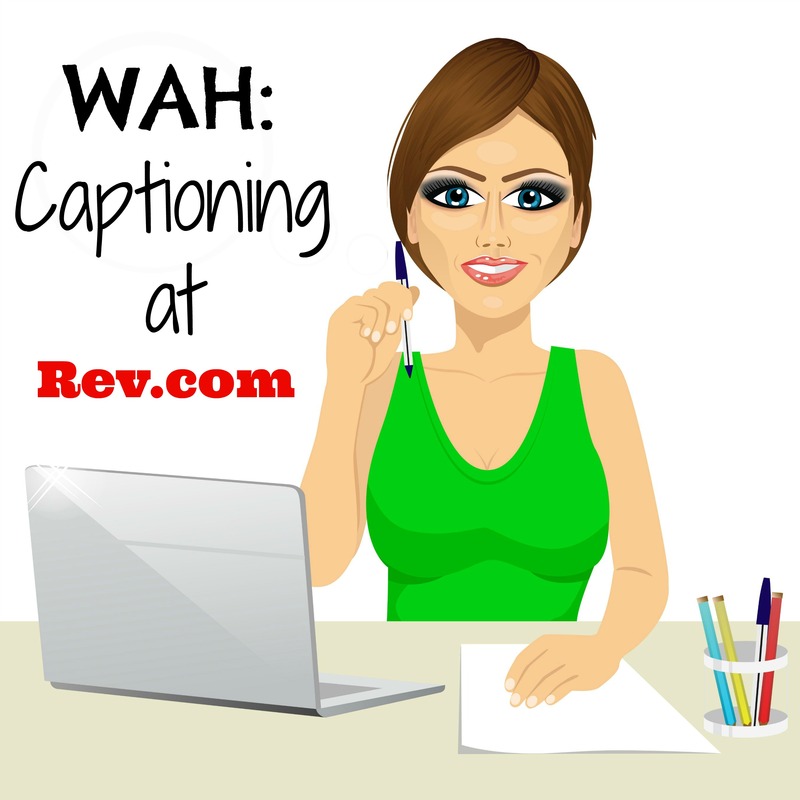 The longer you work on the site, the faster your captioning skills will be, and the more money you can earn. Figure a minimum of three times the length of the video to get it properly captioned and then synced to the speakers’ voices. The site provides style guides to which you must adhere. The forum is a great resource for information and if you are stuck on what someone is saying. Support is just an email away and usually reply in a timely fashion. They welcome your questions and feedback. I applied to Rev at the end of October. Within two weeks, I had worked hard enough and maintained a high enough quality that I became a Reverr+. It is a significant part of my weekly income and some people use the site for their full-time job. Work is not always guaranteed to be available, but they strive to keep plenty of fresh clients coming in, to keep us all busy. The work week runs from 12:00 AM GMT Sunday morning to 11:59 PM GMT Saturday. Anything you complete by this cutoff time will be paid to you on the following Monday. I am in the eastern time zone, so anything I get completed by 7 PM EST on Saturday, I get paid for two days later on Monday afternoon. Payments are done via PayPal, so you must have a PayPal account. While it isn’t for everyone, I find it to be an entertaining way to pull in some income while sitting in the comfort of my own home. They also offer transcription and translation services. Check them out at https://www.rev.com/. Valentine’s Day elicits excitement and the creative bug as you seek new ways to try to show friends and family how much you love them. Doing Valentine’s Day projects with your kids is a great demonstration of love and creates lifelong memories. But crafting doesn’t need to live up to its expensive reputation. Sometimes the most meaningful gifts are those that are the simplest. After all, it’s the message that matters most, right? 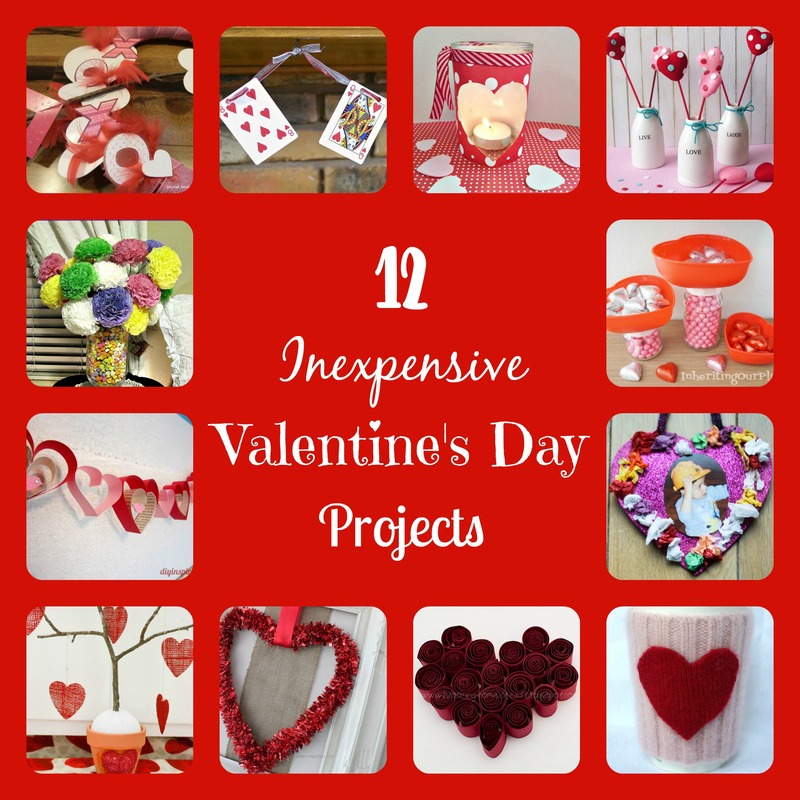 Here are a few of my favorite inexpensive Valentine’s Day projects from around the web. Whimsical Valentine’s Day Wreath – Mama of 3 Munchkins went on a quest to the Dollar Tree to see what she could find to make an inexpensive Valentine’s Day craft. Lo and behold, this adorable wreath with hearts, X’s and O’s. The best part of it all? It only cost her $5 to make. Playing With the Queen of Hearts Garland – Have an old deck of cards laying around? That gives you 13 heart-themed cards that you can put together with some beautiful ribbon to create a unique garland for this Valentine’s Day decoration by Three Different Directions. If you don’t have a set of cards, you can easily find an inexpensive pack at your favorite bargain store. Your kids can easily help you punch the holes and thread the cards, a great fine-motor activity! Valentine’s Day Votives – This Mama Loves has two simple crafts for the holiday that are created using inexpensive votive jars and crafting materials. Choose to fill one with candy or make a beautiful candleholder for decoration. They also make great gifts. Valentine’s Hearts on a Stick – Ribbons and Glue went to the Dollar Store and found materials to make these cute hearts on a stick that add a little Valentine’s Day flair to your holiday decorations. You could also easily adapt the design to fit other holidays and decorative ideas. Tissue Flower Centerpiece – Did you know that simple tissue paper can make an absolutely stunning centerpiece? It’s hard to believe that these flowers designed by Lady Behind the Curtain are this beautiful and this easy to make. When you’re finished making the flowers, put them in your favorite vase. Her suggestion is filling a clear vase with candy hearts. Recycled Jar Valentine Candy Bowls – Need something to do with those leftover jars around the house? Inheriting Our Planet took these and added heart-shaped bowls from the dollar bins to create these sweet candy jars and bowls that will make your party décor unique. They also make another great gift. DIY Garland – DIY Inspired uses leftover craft paper, scrapbook paper, and even old books cut into strips to make an easy garland of hearts. It’s a fun project that even young kids can do and looks great hanging in your house. Valentine Heart Art – Hit up the thrift stores and your local dollar store for the items to create this gorgeous framed heart wall hanging by Oh My Creative. You could even experiment with other ideas to wrap the heart and adapt it for other holidays. DIY Valentine’s Day Centerpiece – Incorporate nature into your holiday centerpiece with these burlap hearts hanging from a branch by Faithfully Free. The crafting materials are items you likely already have at home or can at least get inexpensively. Once you have it started, you can also change it up throughout the year. Scrunched Tissue Paper Valentine’s Heart – This fun and easy craft by In the Playroom is a great way to create a keepsake that you will cherish for years. Your kids can easily decorate the frame and you can put in your favorite photograph. Red Heart Paper Quilling – Paper quilling is a method of design that has been around for several years now. You use strips of paper, tightly rolled, to create three-dimensional paper crafts. Blooming Homestead used this technique to create a paper heart that went on a wall decoration, but you could adapt it for a variety of uses. Felted Coffee Cup Cuff – Coffee cozies are quite popular right now, but most of the patterns require a crochet hook or knitting needles. Fear not, crafters, this no-sew option by Dukes and Duchesses require nothing more than a thrift store sweater and a hot glue gun. They work just as well as their counterparts. Which Valentine’s Day projects are you going to try?